Finally, I have a new video out. This video demonstrates several ways to get your video noticed on YouTube. Basically, it's composed of parodies of popular videos. So, a little over a year ago, I made a post about the evil Burger King. 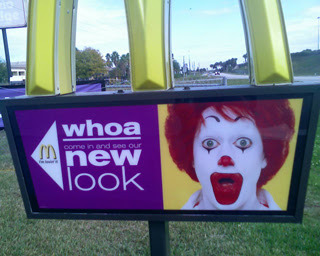 Well, now as it turns out, Ronald McDonald has gone over to the creepy side as well. 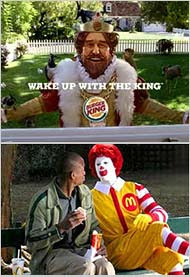 This post, unlike the Burger King post, however, doesn't contain any comical conspiracy theories. Rather, this is my observation of a horrendous design decision. 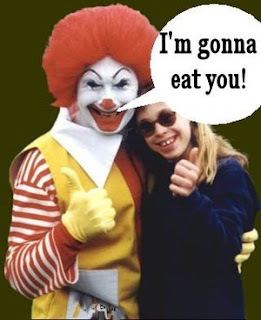 Now, first off, I was never a fan of Ronald McDonald as a kid. I despised those commercials that would come on during childrens programing with their attempts at "child humor". But it seems that the icon of the obese has transcended the realm of bad humor into something even worse. One thing interesting, the classical happy meal commercials, a concept ripped off of the old childrens program, H.R. Pufnstuf, have now been completely revamped. All the classic characters, like Grimace, are gone. The dorky clown with the horrible puns has now been replaced with a plastic talking statue. Now, doesn't that sound a bit familiar? Fortunately, unlike Burger King, The Ronald McDonald statues are incapable of moving on their own. 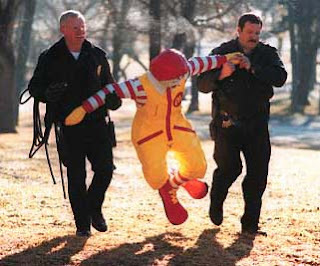 Now, This immobilization of Ronald McDonald is really no big deal. But something caught my attention yesterday. On a roadtrip, I stopped by a McDonalds, to be greeted by this face. No joke. This is the face which will now be gracing McDonalds restaraunts. Now, McDonalds, for whatever reason has been known to attempt a more "grownup" image for their franchise, as they did with the failed arch delux menue. But scaring all the kids away from the restaraunt has got to be bad for business. I seriously began to wonder if I was dreaming after seeing this. I mean, come on, at least the old Ronald smiled. 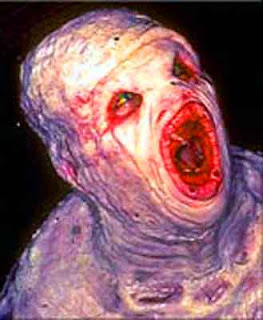 I think I saw this guy on an episode of the X-Files once. So, I decided to do something other than schoolwork for a couple minutes today. I actually logged on to YouTube for the first time in a looooooong time. The founder of J-Dubb's Theatre logging on to YouTube? Who would have thought? Anyways, one thing I noticed on my account, is that my first video now says "Added: 1 year ago". So as of today, I've been making YouTube videos for 1 year already. Hey guys, it's been a while since my last post, so I'm writing this one to say what's up. I've been buuuuuusy lately. Well, go New York. They did what no other team could do this year, and in that last freakin possible game.